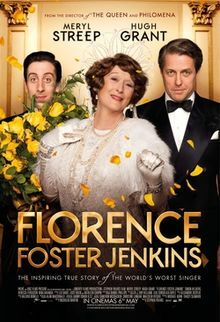 Florence Foster Jenkins is an all-around beautiful film. Streep’s transcendent performance as the titular character is the film’s heart and soul. She is simply stunning. But hers is not the only noteworthy performance in the film. Hugh Grant, Simon Helberg, Rebecca Ferguson, and Nina Arianda make up the meat of the supporting cast, and each of them owns their roles. Oftentimes, with these biopics, the focus is all on the main character while the supporting and tertiary characters fall to the wayside. But that’s not the case with this film. Each of the actors brings life to their characters and makes them human. – Meryl Streep will undoubtedly earn her 20th Oscar nomination for this film, as it would be well-deserved. I’d love to see her go on to take home a 4th Oscar, joining the legendary Katharine Hepburn as the only actor to have achieved such a feat. – I would love to see a Best Supporting Actor nomination for Simon Helberg, as well as a Best Supporting Actress nod for Nina Arianda. It seems very unlikely that the film would be able to achieve 3 acting nominations without nods in anything else. But these are the three I want nominated. – I can easily see it picking up nods for Best Costume Design and Best Hair and Makeup. – I doubt very much that the film will earn much beyond those 5 nominations. On a very slim chance it could get a Best Picture nod, but the last film Meryl Streep was in that was nominated for Best Picture was The Hours. Plus, this is the feel-good film of the year, and the Academy hasn’t given those types of films much love in the way of Best Picture nominations for the past couple years. At this point, it’s still anyone’s game. All I know is that I loved Florence Foster Jenkins. And everyone needs to go see it.